The only problem with traditional silk is that the silkworm, the little caterpillar that spins the silk, lives a very short, sad life thanks to our demand for this luxurious fiber. This is why I’ve largely stopped buying silk unless it’s used or recycled. Many people are unaware of where silk comes from, or what happens to the little worms that spin the silk that we love sliding over our shoulders. People, especially in Asia, have been making silk for thousands of years. The world’s finest and softest silk comes from the mulberry silkworm. What’s happened is that because humans have been raising and farming silkworms for so many thousands of years, the caterpillar has evolved to become completely dependent on humans. There are no silkworms left in the wild; all of them are now raised in homes and farms. Silkworms start out as an egg that hatches 10 days after its laid. The silkworm larvae eat an incredible amount of mulberry leaves. They’ll eat non-stop for 35 days straight! By the time they’re done, they’ll have increased their weight over 10,000 times. The interesting thing about silkworms is that they’re incredibly delicate. Any loud noises, temperature changes, or even strong smells will cause them to stop eating mulberry leaves. If this happens, they don’t spin as much silk because they’re not as big. After it’s fully grown, the silkworm will attach itself to a twig and begin spinning a cocoon. It secrets chemicals from its mouth that, once they interact with air, solidify to form silk. 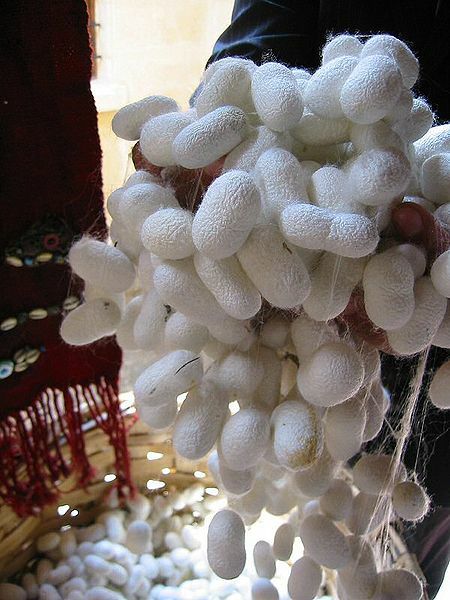 Every silkworm will spin 1,000 yards of silk fiber in just three days. This silk forms the cocoon the silkworm will stay in to become a moth. Now, because humans have been raising and farming silkworms for so many thousands of years, the moth (called Bombyx mori) is 100% dependent on humans. If it’s allowed to live, it’s born blind and without the ability to even fly. It can’t even eat! The Bombyx mori only lives long long enough to lay about 500 eggs, and then it dies. The large majority of silkworms never live long enough to become a Bombyx mori moth, however. And this is where the tale gets sad. After the silkworm has spun its cocoon it will stay in there for 16 days as it transforms into a Bombyx mori moth. Once the transformation is complete, it will begin to excrete a fluid that dissolves a hole in the silk so it can emerge. Well, the silk farmers don’t want their silk damaged by this fluid, so once the cocoon is completely formed they toss all the sacks into boiling water to kill the silkworms. Unfortunately, most of the silk in the world is grown and harvested in this method. The good news is that there is a movement towards a more humanitarian way to harvest silk. Peace silk is silk that has been ethically harvested. 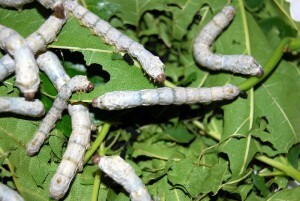 This means that the silkworms are allowed to become full Bombyx mori moths. They emerge from their cocoons naturally, and die a natural death. Peace silk is slightly discolored due to the akaline solution secreted by the moths, but we can wear it knowing that the little worms were not boiled alive just so we could have a bit of luxury! All of the bags we sell here at Earth Divas use recycled silk. Using recycled silk means that we’re not contributing to traditional silkworm harvesting. Buying products that use recycled silk, or buying used silk goods, means that you’re reusing material that’s already out there. And that’s just more sustainable that buying new. I think it’s important that we know where all of our stuff comes from, including fabric! I know I was really surprised when I learned where all my silk had come from, and how it had been harvested. I’d had no idea that the little worms were killed as soon as they spun their cocoons. The more we support people and companies that sell peace silk, or products that use recycled silk, the fewer worms will lose their life for the luxurious fabric they produce for us. visit it, http://davides.rain-blog.com/index.htm , thanks again….